Celebrate your last days of freedom at Delta Force Paintball! A day of paintballing in the great outdoors has it all – adventure, laughter and bonding with your mates. Team up with your nearest and dearest and celebrate a momentous milestone at any one of 35 UK paintball centres. We have extensive experience hosting the ultimate stag and hen parties. We operate all year round and provide 5 star facilities alongside exceptional customer service to ensure a fun-filled and hassle free experience. Our themed games zones will have you and your mates for victory as you are tasked with different missions throughout the day. Will you get to the haunted crypt in time to fend off the zombie attack? It’s up to you and your mates to band together and secure victory and have a laugh at the same time. The great thing about paintballing at Delta Force Paintball is that it’s suitable for people of all ages and there’s no pre-requisite for prior experience. Paintballing is a great activity to break the ice amongst a mixed group of guests, so if you’re looking for the groom and his father-in-law to bond, it’s a great idea to hand them both semi-automatic paintball guns and let them resolve their differences on the battlefield! In addition to the latest paintball gear issued to you for the event, we also encourage presenting the stag or hen with a fetching costume to ensure he or she remains the centre of attention throughout the day. We love dress-ups – and let’s face it, who doesn’t? In case you may have forgotten to pack a special outfit, we offer comedy suits to purchase at the centre to ensure the lucky man or woman has a day to remember! 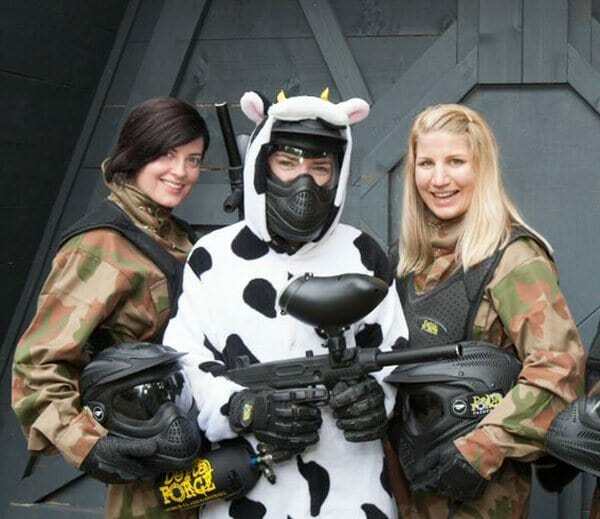 To book a stag or hen celebration at any one of our paintball centres in the UK, contact a friendly event coordinator on 0844 476 5115*. We’re available 24/7 to answer your questions and check availability to book the ultimate experience!